The Kindle Oasis was designed to be Amazon's ultimate reading device. Lightweight, high quality and wonderfully slim, its 2016 launch surprised many, not only by its radical design, but in the ambition that Amazon was exhibiting. Would anyone really pay that much for a reader? The shortcomings became more apparent with the Kindle's top device because they were set in context of those core devices that were dropping in price, like Kindle and Paperwhite. There was a hint of form over function and while the 2016 Oasis was a wonderful device, this rethinking rights a lot of wrongs. Glance at the Kindle Oasis and you'll recognise the design from the previous version. The newer model, however, is sleeker and more refined, thanks to the use of a single piece of aluminium that covers the rear and wraps around the edges. There's a fundamental change in the approach here, dropping the necessity of using the cover to boost the battery life. In the original model there was only 2-weeks of battery life so you needed that cover to bring it back into the reach of regular Kindle models. The new Kindle Oasis has 6-weeks of life, so there are now no pogo pins on the on the underside and a more seamless metal finish instead. At the same time, this is bigger in all directions, expanding to accommodate a 7-inch display, rather than 6-inch display that Kindles have offered since they first launched in 2007. Yes, it's not only the iPhone that's 10-years-old in 2017, the Kindle was too. Otherwise, the design of the Kindle Oasis remains the same, with all the brains in one side of the device forming a grip, while the body stretches to support the display is only a 3.4 mm thick. It's still lightweight, skinny and pocketable, so still every inch as portable as it was before. The use of a single piece back means there's no longer a rubberised covering over the "bulge" which also provides grip. The new Kindle Oasis isn't as grippy as the previous and at times you might feel that it's a little slippery in your fingers thanks to its smooth finish. Connect one of the new covers and things are very different thanks to the tactile leather surface: although the Oasis is designed minimally without the cover, we still get the feeling that the cover is very much a necessity and those covers are of a wonderful quality. There's are two physical buttons on the edge, so you can still press to turn pages, as well as tap or swipe as you prefer, so the interaction and the feel in the hand is very much as it was before, although there's now less travel in the these keys. It's less of a clicky press and more of a nudge. That makes very little difference, it's just something to adapt to. There is, however, a significant update that you can't see and that's waterproofing. The new Kindle Oasis carries an IPX8 rating, so if you happen to drop it in Umm al-Maa, it won't make any difference. For a premium device it adds an extra degree of protection whether you're camping in a leaky tent or prone to spilling your champagne in the First Class lounge. Importantly, it fends off devices like the Kobo Aura H2O. If you're planning on getting it wet, there's also a "water safe" fabric cover. This redesign has made things heavier, however. The new Kindle Oasis, with cover is now 317g, compared to 237g of the old Oasis. Lying in bed, that's a weight you're more likely to feel now, the downside of that increase in size. The expansion to a new 7-inch display suddenly makes the 6-inch display (that's dominated Kindles until now) look a little small. It doesn't make a huge overall difference, but it did suddenly make us think that Amazon might be looking to appeal to those who want larger text to make reading easier. Indeed, there are other "accessibility" features in the new Oasis, including lots more options for larger formatting, as well as full page customisation such as changing the margins and spacing that you currently get. There's also the option to invert the text and background so you can read white text on black, which some might find easier on the eyes. The new 7-inch display is front-lit by 12 LED arrays, an increase over the 10 of the 2016 Oasis. Our first impression is that things look very much the same - it's the same 300dpi so the same resolution as the 6-inch display it replaces - although the increase in the number of LEDs makes the illumination look a little more even than the old versions. 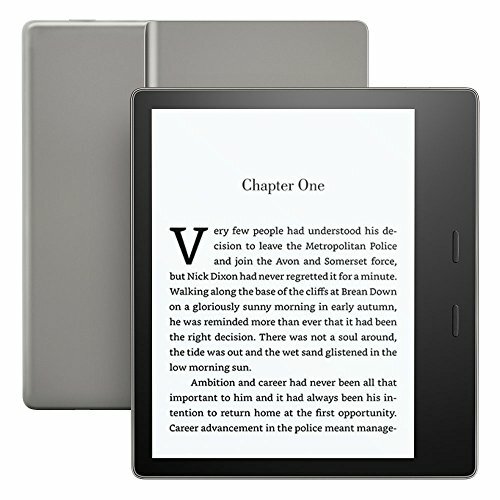 One of the omissions from the old Oasis model was that it skipped over the Kindle Voyage's adaptive illumination feature. At the time Amazon said that it couldn't accommodate the sensors needed to detect light levels in the design, but it seems to have figured that out. There are two sensors hidden in the bezel that can automatically change the brightness of the illumination depending on where you are. That means that it can be brighter in brighter conditions and, importantly, dimmer when it's really dark so it doesn't dazzle. That was one drawback of the previous Oasis - you had to turn the level up and down depending on where you were. Now it should happen automatically - although you might be just as happy to manually turn it off in bright conditions and only have low level illumination for when you're reading at night. What that results in is a sublime reading experience. We've long been fans of Amazon's approach to electronic books and a Kindle is top of the list for any travel we do. Being able to carry more books in a smaller package is a real advantage for long vacations, the ability to read at night without turning the lights on is a godsend for insomniacs or when you're sharing a tent with your kids, and the premium feel that Oasis lends to the experience sets this device higher than other models. We still miss the smell of a new paperback and while we still browse bookshops admiring the cover art and the wonderfully visceral feel of the books, we have to admit that 90 per cent of the time we buy it on Kindle. What could do with an update is the Kindle Store itself. This is a common problem across Kindle devices and there's been little change in recent years; the Kindle Store is a little cluttered, it's not always clear what you've read before and we wish there was a way to easily manage your on and offline reading without a separate app, to make buying choice easier. Which Amazon Kindle is best for you? Kindle, Kindle Paperwhite, Kindle Voyage or Kindle Oasis? Amazon has over 5 million titles in its catalogue, from bestsellers to self-published, from top price to free, with a range of ways to access that content - pay as you go, Prime Reading or Kindle Unlimited for example. Then there's Audible, the audio book side of Amazon that's never really got a look-in on Kindle until now. In the Kindle Oasis there's support for Audible books provided partly by that bump in storage (a typical Audible file is about 150MB), but also in the addition of Bluetooth. That means that you can connect to speakers or headphones - or indeed your car or motorhome - and play Audible books through that connection. There is no speaker or 3.5mm headphone socket, it's Bluetooth or nothing. We're happy with that, because it means that those who don't want Audible are not encumbered with design features that ruin the aesthetic for a function they'll never use. Connection is completely simple through the settings menu allowing you to pair with a Bluetooth device and off you go. Then you simply have to download the Audible file to your Kindle and press play. For Audible titles you have, there's syncing with other devices too, so if you are listening through your Oasis you can pause and switch to have your Echo resume the playback. Or, indeed your smartphone, which raises the question of whether anyone needs standalone Audible playback through the Kindle, when it's covered fairly widely already. On one hand, it brings the consumption of books under one roof, but using your phone to listen might just be an easier answer. However, if you have Audible versions of the book you're reading, you'll be able to tap the icon and switch to playback rather than reading. We tested this with George RR Martin's A Song of Fire and Ice and found seamless switching back and forth was easy. We can see the appeal too, as you'll be able to move from reading, to listening on that 4-hour drive, and then back to reading once you're tucked up in bed. But we're still now wholly convinced that this is a huge addition to Kindle. It's also available on the entry-level Kindle, so it's not as though it ratchets up the price, which at least means you're not really paying for a feature that you don't want. Of course the rest of the reading experience remains very much as it was before with integration into the Kindle Store and WhisperSync across your books. The standard version gets Wi-Fi to take care of this, while there's also the network connected version that allows you to roam around the world, always syncing, and able to download new books on what ever beach you happen to be lying on. One of the things that will make a substantial difference to the price you pay for your Kindle is whether you opt for Wi-Fi only or 3G. As with the original 2007 Kindle, this provides connectivity globally, with Amazon picking up the bill. It means you can be lying on the beach and you can download the next instalment of the series you're reading. In modern terms, however, 3G connectivity in the age of smartphone hotspots might simply be unnecessary: instead you can turn on the hotspot on your phone and use roaming to browse and buy - and probably without it costing you a huge amount. That might lead you to the Wi-Fi versions with the 8GB being the most affordable at £229. The attraction of more storage perhaps doesn't shine through as it might with a smartphone either. We've lived with 4GB storage on Kindles for years and the basic device here doubles that: we fail to see how we'd need 32GB. The other thing to note about the Kindle Oasis is that there's no "special offers". Lower tier Kindles get these adverts in exchange for a slightly cheaper price. On the Kindle Oasis you're spared that option. The original Oasis had some problems. It was by far the most expensive Kindle, but it wasn't the most advanced. It was a case of form over function. The new Kindle Oasis flips that position on its head and delivers more. It's the full functionality of all other Kindle models, it does everything that any other does, while offering that premium design which now includes waterproofing. We struggle to get excited about the Audible integration, however. If you're the sort of person who partners your Kindle with a smartphone, you'll likely have your Audible bases covered, although the syncing and switching from reading to listening might appeal to those more established Audible users. But that doesn't detract from the brilliance of the new Oasis. While we struggled to recommend the old version in light of the sturdy performance of the Paperwhite, we'd happily vouch for the new Kindle Oasis. It's bigger, it's better, it's waterproof. It might be expensive, but it's the the most accomplished Kindle yet. The really big question is whether the sum of all these new parts can convince you that it's worth paying twice the price of a humble Paperwhite.